We fell asleep in total darkness, and woke up to desolate beauty. In the distance, wisps of fog floated alongside the ridge, and the glacier sprawled across the horizon. I was so glad that after my scare the previous night, I had told Kurt we could go back and camp in this spot. On our way to Jökulsárlón, we got our mini coffees at a gas station filled with Japanese tourists putting on crampons and harnesses for a glacier expedition. 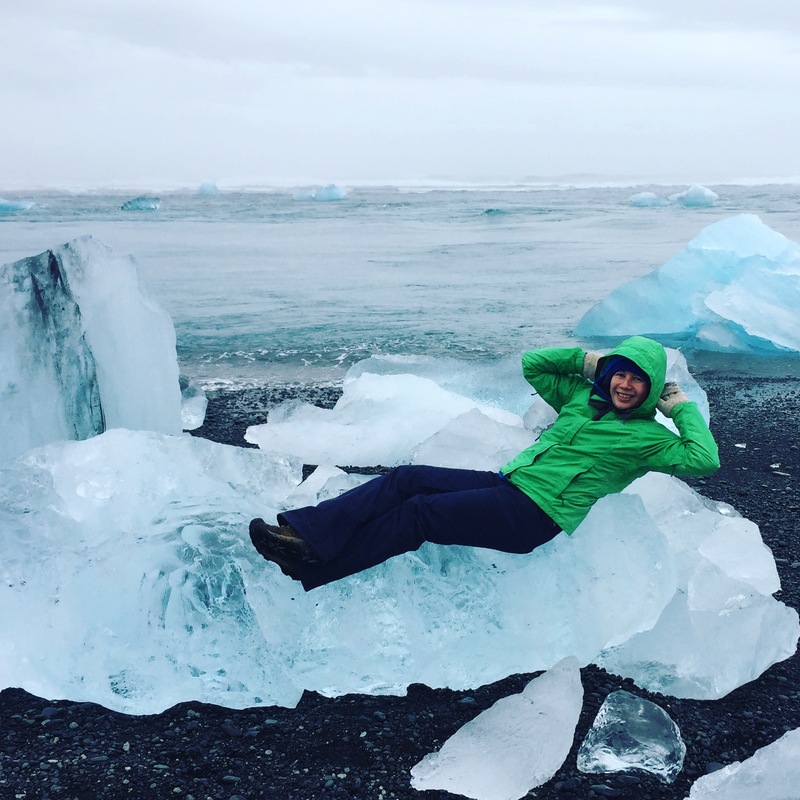 I had some FOMO since Kurt and I hadn’t signed up for an ice caving expedition, but on the other hand, leaving our schedule open and flexible was allowing us to get all the way to Jökulsárlón and back in 3 days while making plenty of stops along the way. 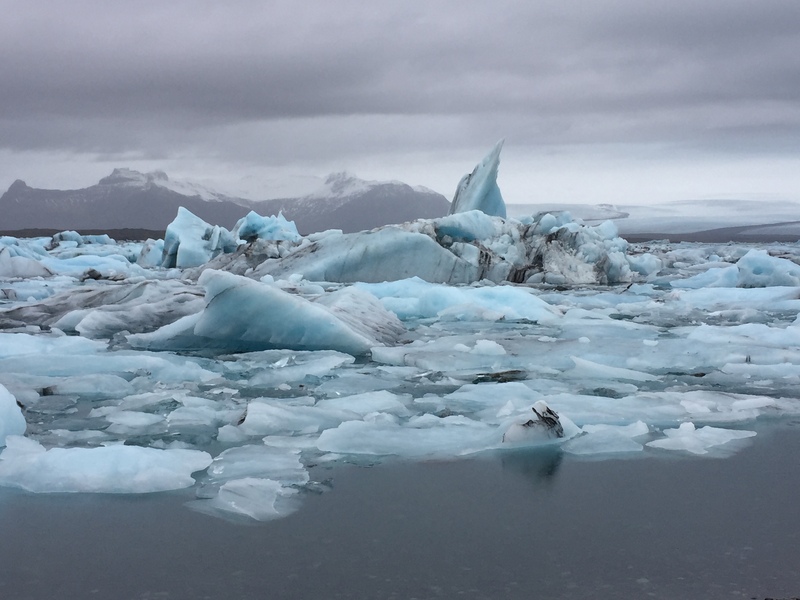 Out of everywhere we’d been so far, Jökulsárlón, or Glacier Lagoon, and Diamond Beach felt the most otherworldly, closer to a Star Wars set than anything we’d seen on any of our North American camping trips. As icebergs calve from the glacier, they float downriver and gather in the lagoon before drifting off into the ocean. While we took in the scene, we spotted a few small heads bobbing in the water. A trio of seals swam among the icebergs, occasionally diving into the water searching for food. On Diamond Beach, the black sand is covered with a collection of grounded ice boulders, some so pure and clear that you can see right through them. Glacier Lagoon marked the turning point for our drive back to Reykjavík. I was sad that our little road trip was already coming to an end, but at least there was another stop to look forward to. Around mid-afternoon, we arrived in a small town just off the Ring Road and began looking for Seljavallalaug. 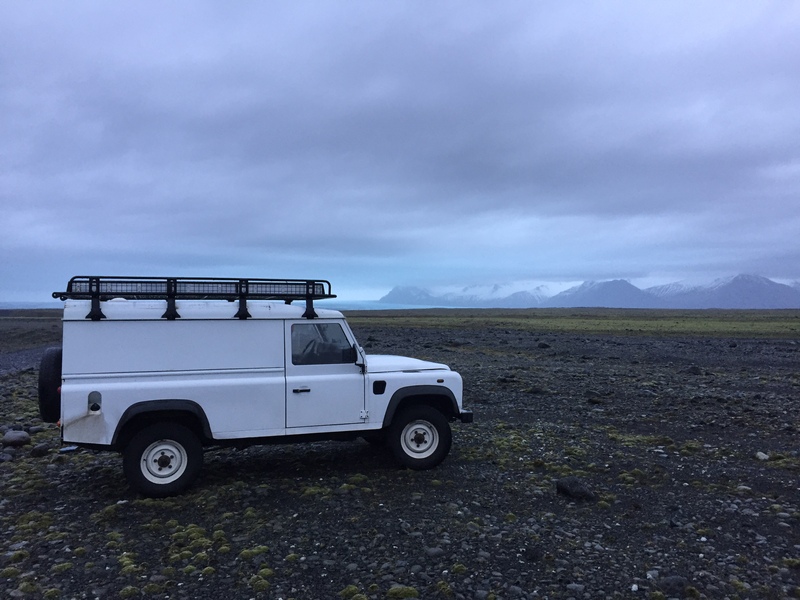 A friend who has traveled to Iceland several times recommended the spot to me; she had me at the word “Instagrammable.” There were no signs prompting us where to go but we knew we had a 20-minute walk ahead of us, so we parked the Land Rover in an area where we saw a handful of other cars and campers. A group of twenty-somethings had just arrived back at their car holding bags of towels. A girl leaned against the bumper and dumped a liter of water out of one of her Doc Martens. We were pretty confident we found our spot. After tossing our towels and suits into a backpack, we started walking into the valley. Ahead, a few other hikers in brightly colored rain jackets helped lead the way. The trail was made from the bootprints of every swimmer who proceeded us. We came to a river that was probably flowing more heavily that usual at this time of year due to the warm weather and consistent rain. Kurt easily hopped from rock to rock with his long legs, but it took me a little more maneuvering to get across; the last thing I wanted to do was slip on a wet rock and crash into the river. As we got further down the trail, the telltale sign of rising steam led us straight to the spot. “Instagrammable” was right. Seljavallalaug is a pool nestled against a rock wall; hot water tumbles down the rock face into the pool, warming the cool water into temperatures pleasant enough to swim in. The pool is unguarded, with no entrance fee or anyone attending it. There’s three changing rooms available for getting in and out of your clothes, with some hooks on which to hang your things. As more people made their way to the pool, it took some knocking on doors and inquiring if each room was in use by men, women, or a group of both. When we first got there, only one other couple was in the pool. We arrived at the same time as a pair of women, and we climbed in together, exclaiming over the gorgeous scenery. It was tranquil and perfect. As we soaked and swam, more and more hikers appeared. Two girls emerged from a changing room wearing bikini bottoms and posed in the water for pictures while flashing the peace sign. All of a sudden, a large group of dudes showed up, outnumbering us all, and the atmosphere changed from peaceful to rowdy as it quickly became a German sausage party. We and the other couple decided it was time to hike on out. Back on the road, I wanted something hot to eat and a beer sounded pretty good too. We had ventured off the Ring Road onto some of the smaller local routes, and the GPS wasn’t helpful in finding much in the area. We almost gave up and stopped at a rest stop for another night of cold cut sandwiches, but suddenly spotted some lights in the distance and decided to investigate. It turned out to be a small hotel with an all-you-can-eat buffet and cold Gull on tap, everything we wanted in that moment. The dining area was mostly overtaken by a gaggle of high schoolers and their teachers on a school trip. We ate as much salad, lamb, fish cakes, potatoes, and pudding as we could fit in our stomachs. Gotta get our 4300 ISK worth. Satiated, we found a rest stop in, of all places, a wooded area. Iceland is fairly devoid of forests, so parking among tall trees and pines almost made me feel like we were back in Wisconsin. A dark, overcast sky above us didn’t look promising for Northern Lights, and soft rain pattered on the roof of the Land Rover. Settling in for the night with the rest of the boxed wine, we drifted off to sleep to the sound of rain falling on the trees. Hey… Photographs are amazing. Everyone should take care & don’t need to be experimental specially if they have kids. I have enjoyed Iceland helicopter tour with TripGuide Iceland travel agency last month. It was amazing. It’s really very informative. Because I am planning to fly over Jökulsárlón. I was exploring Iceland Helicopter Tour packages. I have found TripGuide website. Can you suggest me more travel agencies in Iceland? Hi Emilio, I’m glad you found my blog helpful! We booked our excursions through Hey Iceland at http://heyiceland.is/. Best of luck with your trip planning and I’m sure you will love Iceland!